I must say I love driving out here in Pennsylvania!! They don’t know how to build a straight road or they just encourage their road workers to drink on the job, either way it is just wonderful. This is a big change from the flat, straightness of every road in Nebraska and I have been pushing this little car into every corner I can find. I wasn’t to excited about getting the economy option for my rental car but I really couldn’t justify anything better, since it just me out here. I also wasn’t happy about getting the Chevy Cobalt. I had a coupe version of this car once on a business trip, I only spent about 10 minutes in it and I wasn’t to impressed, this time I have it for two weeks. First off, like every rental car I have ever had the person that parked it must have been seven and half feet tall, so I had to spend 20 minutes adjusting the seat. This is where I found my first complaint, the space between the door and the seat adjuster is extremely small, I tried to adjust the back rest and came back missing my wedding ring. It was pined between the door and the lever and slipped off my finger. So after a brief panic attack, I found my ring and opened the door the finish adjusting the seat. I reluctantly started the engine, and wasn’t surprised, it sounded like…well, crap. Then I went to release the park brake and jammed my elbow into the center console arm rest, you have to lift it to get to the brake lever!? I finally got it on the road and it actually drives pretty well. 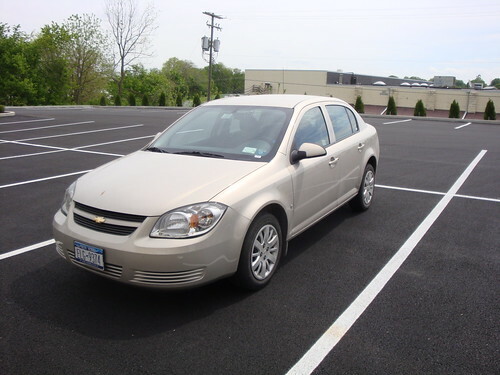 The Cobalt had no problem humming along the highway at 70 mph and …umm, lets just say faster. This is where I found another complaint, no cruise control. This thing has a CD player with an Aux jack and an on-board computer thingy but not cruise control. For the drive to the office from the hotel I intentionally picked a route that avoided all highways, which means Amish back roads! Picture a mid-level rally course on very smooth asphalt. Wide open countryside with bends and hills, it is beautiful and incredibly entertaining, until you come over a hill and have to slam on the brakes to prevent plowing into the back of a horse and buggy. The car handles pretty well, for a front wheel drive car. When you really start to push it in the bends the tires do start to squeal, but there isn’t much body roll. The engine and transmission is also quite good, you can easily brake the tires loose on dry pavement and when you have your foot stuck in it, it shifts quite smoothly at 6000 rpm. The brakes on the other hand are rubbish. For a small, light car it is frightening to stop from high speed. The interior is not nice but it is not that bad, mostly plastic but they tried to make it look good. It is a comfortable car, once you spend 20 minutes adjusting the seat. The cup holders hold a styrofoam hotel coffee cup adequately but in did manage to turn hard enough to get coffee all over my leg, on the way to work, of course. So then the question is, would I own one…no. Well at least not this model, I would rather have a two door with a manual transmission. If we do ever end up moving out here, yes that is a possibility eventually, I would definitely get something similar. If I didn’t I would end up in my truck, nose down in a ditch every day. This entry was posted on May 10, 2009 at 7:50 pm and is filed under Cars, Rants. You can follow any responses to this entry through the RSS 2.0 feed. You can leave a response, or trackback from your own site.